MITZPE RAMON, ISRAEL–On our way back from Eilat this afternoon, Will and I took a short hike to see the “Ammonite Wall” on the southern outside beds of Makhtesh Ramon. 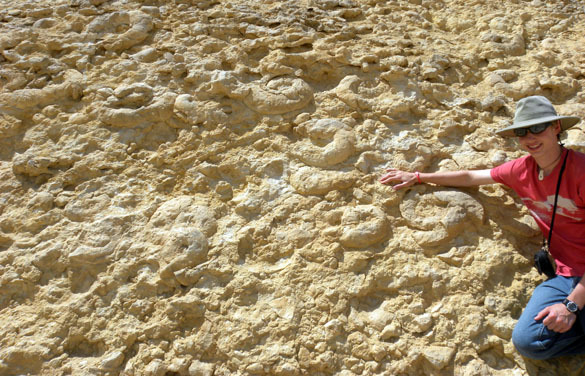 It is an impressive tilted array of large ammonites in the Tamar Formation (Cenomanian). Current thoughts are that this represents a massive death assemblage. 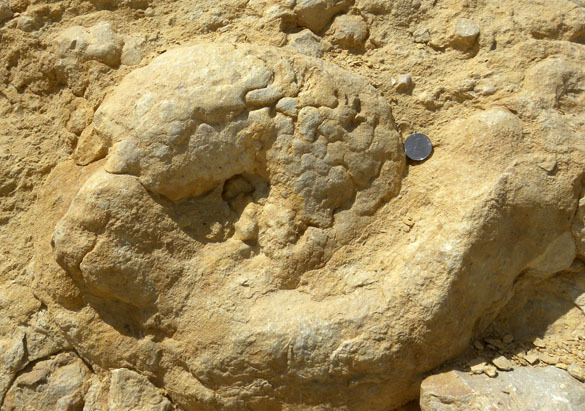 The ammonite conchs, which all seem to be of the same species, washed into an embayment and were buried. This is not uncommon as ammonite conchs probably filled with gases after death and floated great distances. They are all preserved as internal molds, with a few, such as the one below, showing their suture patterns. 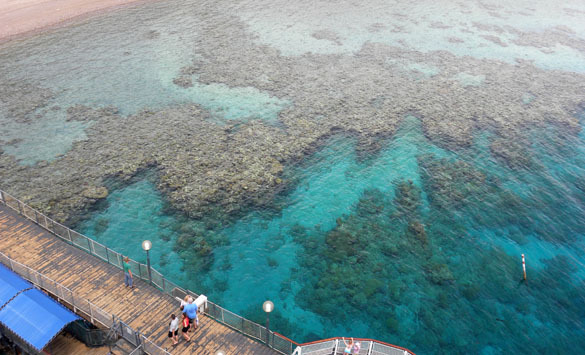 Fringing coral reef seen from the top of the Underwater Marine Observatory tower near Eilat, Israel. EILAT, ISRAEL–When I first visited the Underwater Observatory Marine Park outside Eilat on the Red Sea coast near the Egyptian border, I was enchanted. An elegant steel and glass tower was built into a reef so that you can descend well below sea level and look out at a living, natural reef. I’ve brought students to this Observatory ever since to enjoy the beauty of a reef close-up without having to get wet. It is also a splendid place to see living analogues of the many organisms we are studying as fossils in the Jurassic and Cretaceous. 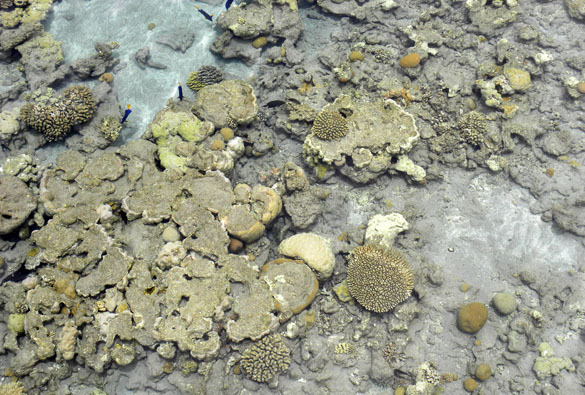 Closer view of the reef in the first image. Almost all the corals are dead. 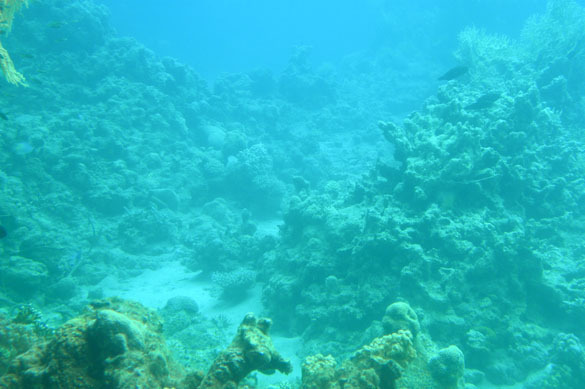 Alas, the Eilat coral reefs are dying quickly. I see a significant difference in the health of the reefs in the last eight years. Most of the framework corals are completely dead, leaving gray aragonite skeletons to be sparsely inhabited by sponges, feather worms and the inevitable algae. The park tries gamely to keep up appearances at the observatory windows, but it is clear that the dwindling diversity of fish is now the primary attraction, not the corals themselves. 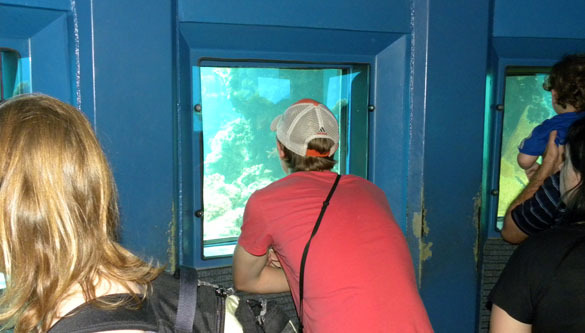 Will Cary looking out one of the underwater windows into the coral reef. Coral reefs are dying all over the world, but their rate of disappearance in the Red Sea is unusually high. There are many causes, my biologist friends tell me, most related to the narrow nature of the Gulf of Eilat here. Many ships pass through daily, water-loving tourists are abundant, and wastes inevitably drain from the cities of Eilat and Aqaba into the sea. There is also a problem of sand being added to hotel beaches which gets redistributed onto living reef. The coral reefs viewed from below. The framework is mostly dead coral skeleton. Fifty years ago there were about 10 square kilometers of living coral reef in this area. Now it is less than 2.5 square kilometers, and much of this remaining reef is so stressed that no new corals are recruited. Very sad. In the future I may be showing my students a few living corals preserved in the aquaria of the Underwater Observatory Marine Park, and then looking out at what happens to an ecosystem when the reefs die. 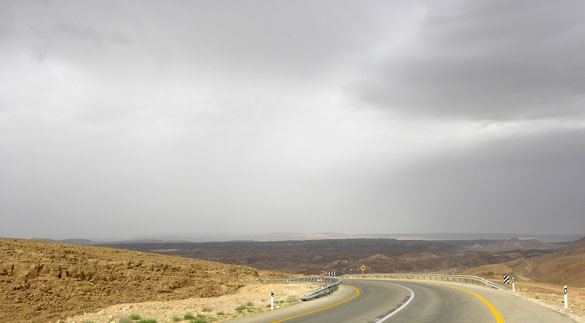 MITZPE RAMON, ISRAEL–The only other time I’ve seen rain in southern Israel was with Elyssa Krivicich on our March 2008 trip. By May the rains are done in this part of the world. Nevertheless, it rained last night and then sprinkled on us as we drove south to Eilat this morning. The temperature has also dropped a good 6°C, which suits us just fine. This is the 400th post on the Wooster Geologists blog! It is also near our two-year anniversary. It appears from our statistics (which I do not fully understand) that we have had 21,793 visitors and 163,072 pageviews. I’m not sure if those are unique visitors or what a “pageview” is, but I know we’ve had enough feedback to make this project much fun.